Dimensions: L: 17" x W: 8" x H: 13.5"
Awesome toy! My son adores playing with it. Shipping was easy and quick! Extremely well made! My 12 year old grandson with autism has not left it alone since he got it! Thank you for such a great sensory toy! Durable, great colors. This is the 3rd time we are ordering a sensory bead toy for my daughter. Previous versions have been plastic (twice as much!) and have not withstood heavy-duty handling. So far so good with this one. My daughter loves it! 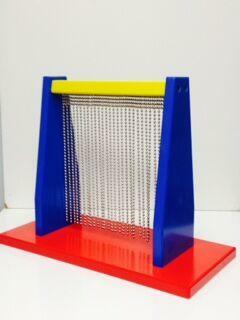 Our son, who has spastic quadriplegic cerebral palsy, will play with this toy for hrs on end. We have tried other makes and models but this one is the clear winner! We've had it for 2 years now and the beads have not discolored and it is still in one piece, which is more than I can say for other more expensive models out there. The paint is showing some wear and tear but that is to be expected. Please don't stop making these bc when ours does finally give out we'll be back here to replace it! Great product! Great price! my adult autistic son loves this! My son loves it. He broke his last one so I'm hoping this one will last longer as its wooden. It arrived promptly. Would recommend. We are very happy with this purchase. It was suggested to us by a member of a special needs parenting group. We were impressed how quickly it arrived. It was packed very well so it was not to get damaged. Our son has really enjoyed his Christmas present. Excellent quality and price! My daughter has not seen this yet as it is a Christmas present but this is her favourite thing in school so I'm sure she will love it. Brilliant sensory toy. Encourages open hands to explore, and development of a pincer grasp. Also great to encourage side lying. Our daughter loves this.....she can easily grasp the beads and it holds her attention.